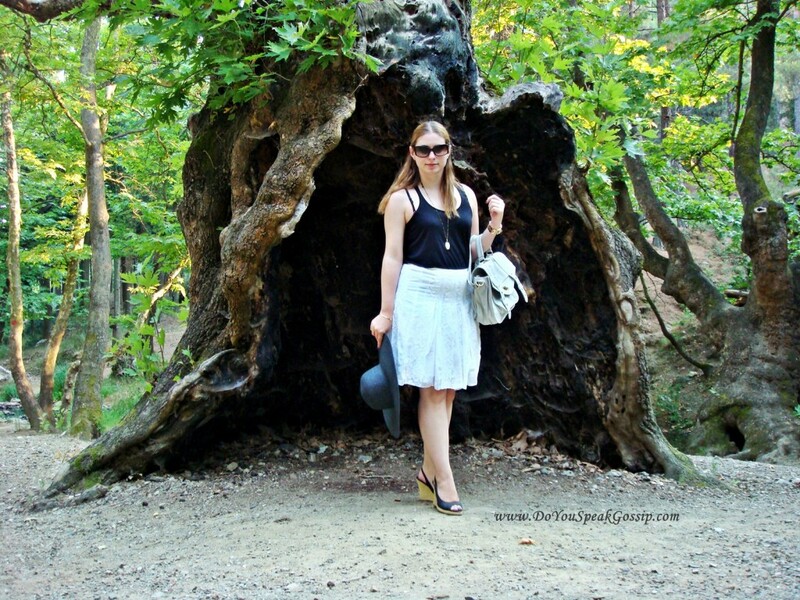 A forest full of plane trees... - Do You Speak Gossip?Do You Speak Gossip? I went there again a few days ago to take these pictures for my blog, and I promise to go back again really soon. I couldn’t really decide on which ones to include here, so I have to warn you that there’s going to be a picture load on this post. Wearing: top: Zara, skirt: no idea (bought a few years back in a local store), bag: Savil, shoes: exe (Greek brand), hat: Stradivarius, necklace Oysho, watch: Michael Kors, bracelet: gift from my godmother. Sunglasses: same as always, Donna Karan. All photos are taken by my boyfriend, whom I want to thank again for helping me. This is definitely the best “photoshoot” we did, I really enjoyed it, but most of all I enjoyed the scenery. 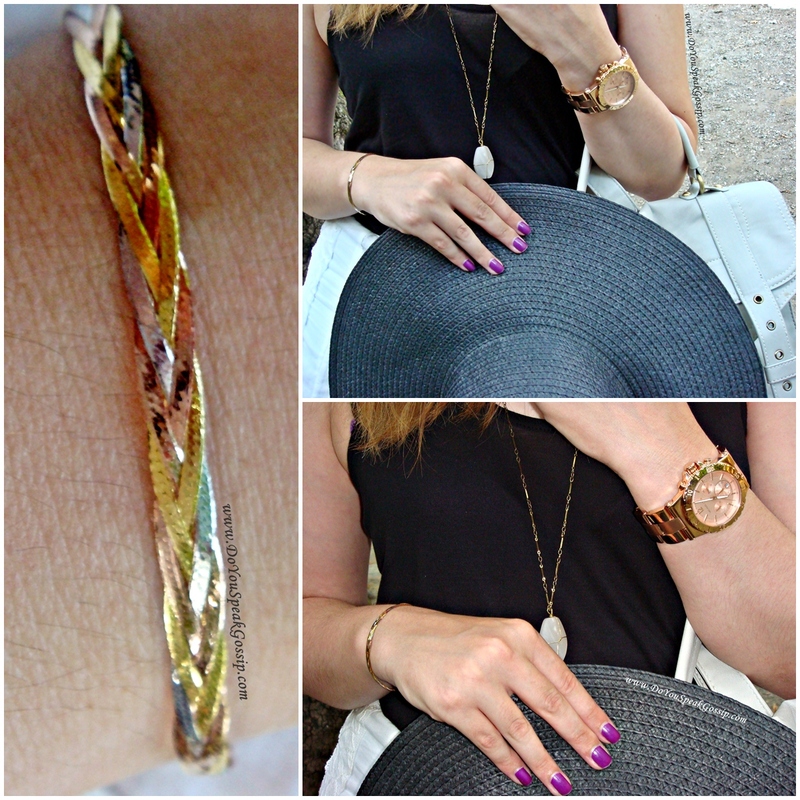 The bracelet is a braid made with 3 materials: silver, gold and rose gold. I had it for many years, but this is actually the first time I’m wearing it. Like my blog? Please show me your love by following it any way you like. There are widgets on the sidebar. And the landscape… fantastic! The hollowed tree, what for an amazing view! Once I heard that when many Italians, coming to my country, didn’t have where to live, they to live in trees like that – I’m not joking. So, I hope you have many nice days in Chalkidiki, I’m sure you will! By now, of course you know, I won’t be going there in August – such a pity. 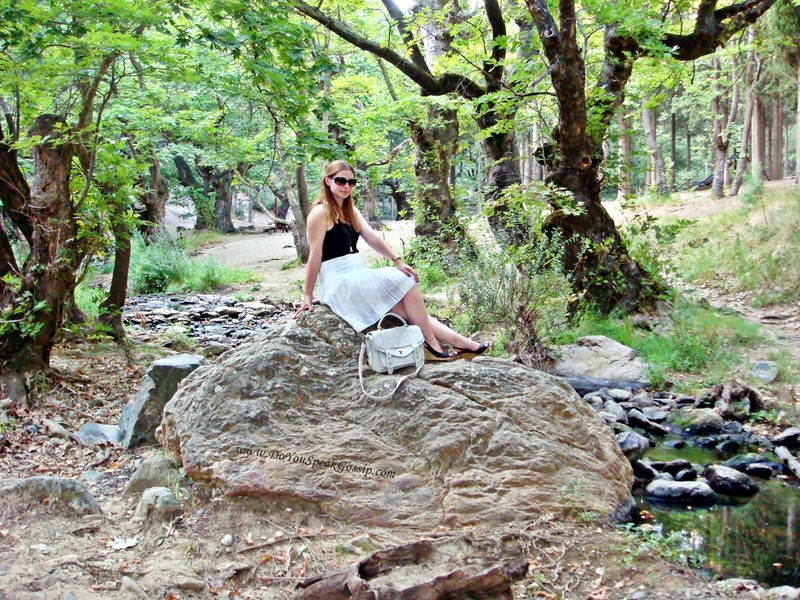 I’ll wait for you to come to Salonica to tell you about my adventures…! Have a fantastic time now, enjoy a lot! Filakia polla! Hello Denise! Sorry, for taking me so long to reply to your comment. I was so busy since I got back! I finally got some time to reply. Thank you so much for your lovely comment! This post is one of my favourites too(if not my favourite one). But unfortunately, I was on vacation so it didn’t get the attention I think it deserved. Too bad! But I have something in my mind. That park is Beautiful!! and I love your outfit! that bag is gorge!! Thank you so much Camylla! plane trees are my favorites!!!! You loook stunning, so, so beautiful! Just breathtaking! From head to toe. Thank you so much for your sweet words Ramona! It means so much to me that you like it! you chose a very nice locations for this photoshoot and I’m loving your back and white outfit (especially the bag…I’m a bag person after all)!! Have fun in Chalkidiki! I’m leaving for vacations tomorrow!! Thank you very much for your lovely comment Anna! Yes, I know about plane trees and their need for lots of water and space. Unfortunately, that was what my mom told me when I asked her, year ago. Too sad though, I love their smell. Thank you all for your comments girls. I’ll comment on each one idividually when I’ll get back. You look like such a lady. Thank you so much Kel! You’re so sweet! love your hat and bag!!! you look adorable here. 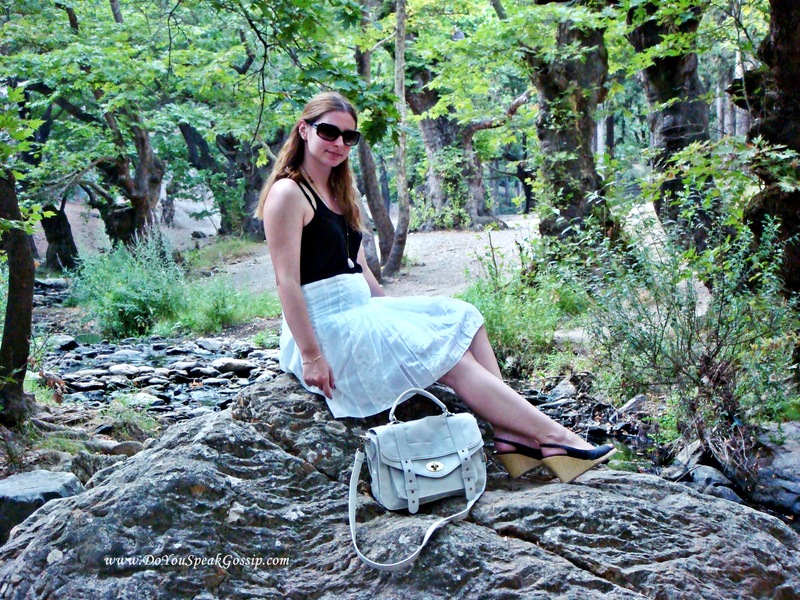 i love the floppy and satchel…and the location is beautiful! that tree in the 4th picture is simply amazing! Thank you so much! 🙂 Yes I loved that tree! From the moment I saw it, I knew I had to take a picture in front of it. Great outfit, you look so good in these pictures, I love your skirt and the blouse is awesome and that hat is so cool, I love it and you are so beautiful! Your have a lovely blog and I’m a new follower! Hope you’ll like my blog and follow back! And thank you again for following me. I’ll visit your blog ASAP. Your look beautriful and very feminine! 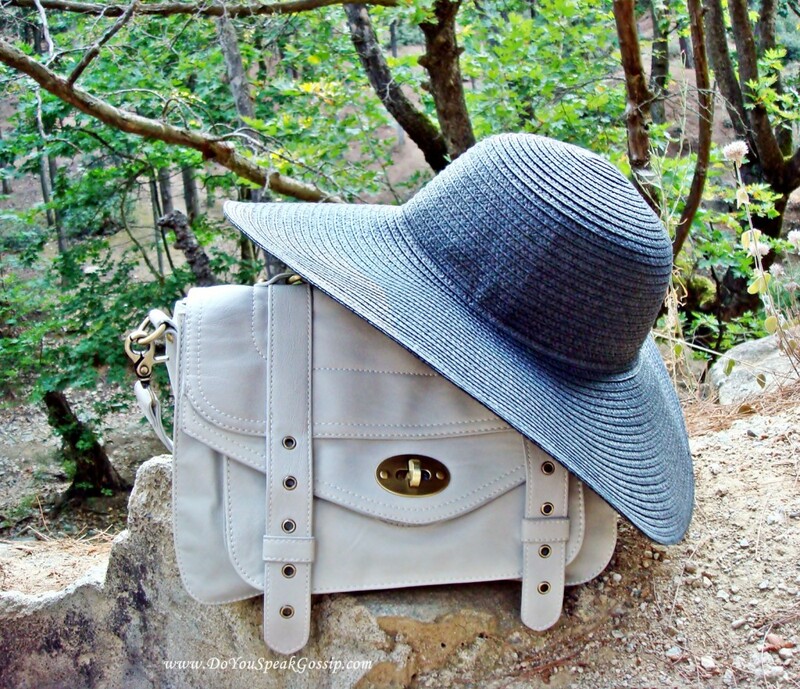 I love your classic black and white combination and the bag and hat are gorgeous:) As for the location, amazing!!!! Ταλαιπωρία να δεις εγώ εκεί!!!!!! Μιας και δε τα πάω καλά με τη φύση, ένα κι ένα για εκεί ήμουν! :) Γλυστρούσα στις πευκοβελόνες!!!! Sou euxomai na peraseis kala sti Zirixi! Siga siga tha sinithiseis! Einai logiko na sou leipoune ta agapimena sou proswpa! Pingback: Favourite outfits | Do You Speak Gossip? Ti skiniko einai auto? San paramythi! To kapelo kai i tsanta einai apisteuta! S’euxaristw para poli! Nai einai teleio meros, to latrevw…! 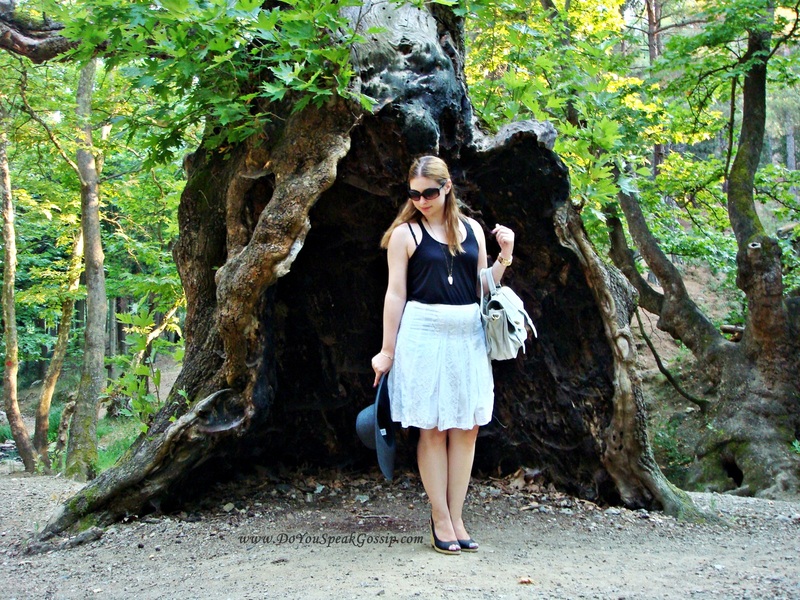 Pingback: Chalkidiki Diary | Do You Speak Gossip? Pingback: Military green & biker boots | Do You Speak Gossip? Pingback: A casual day in paradise | Outfits | Do You Speak Gossip?